WESTBROOK — The Westbrook Children’s Project will celebrate its 10th birthday this year and move forward without the administrative support it has been receiving from the United Way of Greater Portland. Formed in 2009 with the help of the United Way, the Westbrook Children’s Project’s goal was to create a network to support children “from cradle to career,” said Superintendent Peter Lancia. Participants include school and city officials, business leaders and members of the community. “It is an impressive community collaborative and work that we are very proud of. The work of Westbrook Children’s Project is special because it uses a variety of data, both quantitative and qualitative to really understand the needs of the community and respond to them in order to support children,” Jennifer Burns, senior director, education, for the local United Way, wrote in an email. The United Way soon will step back in its involvement, but will still be an active member of the group. “At the end of June we will become one member in the group and no longer serve as the ‘backbone’ whose role in a collective impact model is to provide vision and strategy, support activities, create a shared measurement system, build public will for the project, and advance policy,” Burns wrote. Lancia said the hope is to find grant funding to hire a project manager for the Children’s Project. “Without that grant funding for that coordinator position, the Children’s Project would not be a broad as it is,” said Lancia, who is optimistic funding can be found. Despite the new structure, Burns and Lancia said the focus on youth will not change as the Children’s Project enters its second decade. “Times of transition are tough, but the school district and everyone involved is very committed,” he said. Since 2012, the Children’s Project has distributed 1,000 “Welcome to Kindergarten” literacy kits to help students and their families be prepared for public school, said Burns, a member of the steering committee. Through its Westbrook Partners for Prevention Coalition work group (formerly Westbrook Communities that Care), the Children’s Project sponsors a “prevention week” in early May in an effort to keep students substance free and safe during the days leading up to high school prom. Through its Out of School Time Work Group, the Children’s Project and the school district nutrition staff have served 100,000 summer meals to children at nine sites throughout the community. With the help of community partners and the Walker Memorial Library, it provides a Westbrook bookmobile to make sure kids have access to books throughout the summer. When the Children’s Project started, Lancia said, many K-2 students were having behavior issues as they tried to acclimate to school. Saccarappa and the former Pride’s Corner School, the school district and the Children’s Project piloted a positive behavior intervention and support program that was an immediate success and has since been launched at Westbrook’s other schools, he said. “It has really provided a means for people to get together around the table and focus on the success of our children and break down the barriers that previously existed,” Lancia said of the impact of the Children’s Project. 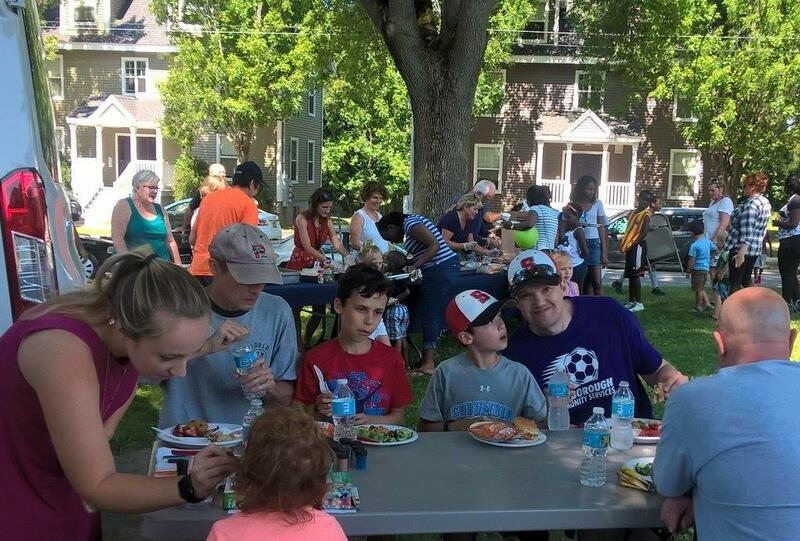 One of the aims of the Westbrook Children’s Project is to make sure children have access to nutritious meals throughout the summer when they are not in school. The organization, a collaboration of community groups, is celebrating its 10th year in 2019. Aside from providing food to students throughout the summer, The Westbrook Children’s Project also provides literacy kits to incoming kindergarten students, works to reduce adolesceny drug and alcohol use and works to make sure students K-12 succeed both inside and outside the classroom.